Mold is a toxic substance that should never be present in your home or building. Not only is mold unsightly it is dangerous for humans. Don’t be in the same room with household mold because it has real potential hazards for your health. There are different types of mold and their effects on human health vary. Mold in house is quite common and they thrive in environments between 60 to 80 degrees Fahrenheit. 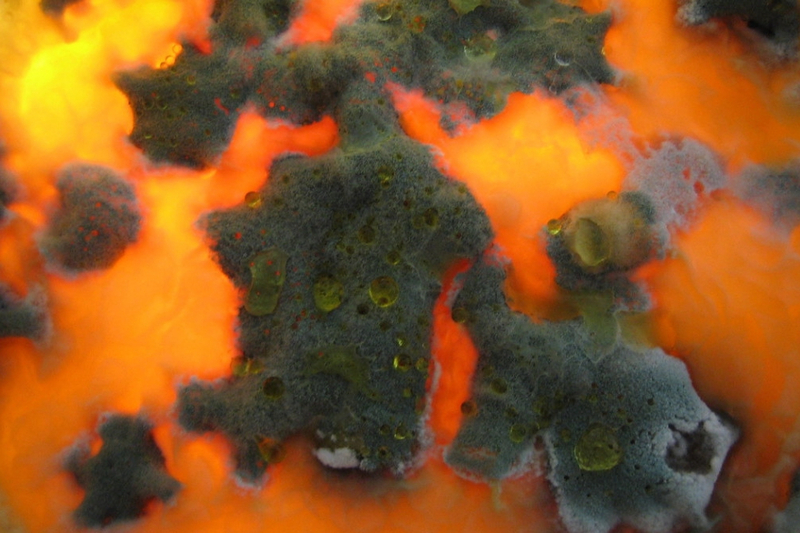 Approximately how many species of molds exist that are fairly common? There are 12 common types of mold in home and mold types. The types of molds vary from benign to the most toxic. The common mold includes Aspergillus which is one of the types of mold in homes and is dangerous only to people with weakened immune systems. How many species of mold exist that are toxic? There are about fifteen toxic mold types that can cause real harm to your health. Be wary of these dangerous mold types like Stachybotrys one of the more severe types of toxic mold that can cause fatal disease which affects the liver and kidney. Stachybotrys is seen by the naked eye as a greenish black slimy mold that grows on paper or wood that has been wet for a long period of time. If you ever see the tell-tale signs of mold growing in your home or building you should get rid of it immediately either by applying some chemicals and doing some manual work cleaning and scrubbing it away. You should also hire mold experts if the mold growth is already extensive and you need professional grade equipment to restore hygienic air quality in your place. Acremonium is a type of mold that is toxic. This type of mold evolves in its appearance over time and first starts out as a small moist mold that becomes fine powdery in substance. Can mold be orange? Acremonium is sometimes known as orange mold because it can be orange in color however it can also appear as pink, grey or white in color. Acremonium typically grows in moist areas on the home such as humidifiers, cooling coils, drain pans, and window sealants. Exposure to acremonium is highly dangerous. This mold can lead to diseases in the bone marrow, immune system, and other organs. Acremonium is toxic and is considered a carcinogen that can also impair brain function. Acremonium can grow alongside other types of mold including Stachybotrys which combined, makes for a dangerous and unpleasant mold problem in your home. Alternaria is the most common allergenic mold found in the world. It has a distinctive velvet texture with dark green and brown hairs. Like other molds, it loves moist and damp places. In homes, you will find this mold growing in the shower, bathtubs and below leaking sinks. Alternaria is the most common mold species that grows as a result of water damage to a home or building. Alternaria is known to cause allergies and asthma-like symptoms. Inhaling this mold can cause irritation in the upper respiratory tract, nose, and mouth. Since it spreads quickly it is important to get rid of this mold before a house or building is overrun by it. Aureobasidium is another allergenic mold. You can find this mold growing behind wallpaper or wooden surfaces. This mold develops into pink, brown, or black colors. Aureobasidium, turn a darker brown color as it ages. Some health risks of being exposed to Aureobasidium are infections of the eye, skin, and nails. Never touch this mold directly with bare skin because it can cause dermatitis or skin rash. Fusarium is a mold that can grow on colder temperatures. It has both allergenic and toxigenic properties and grows in homes with water damage. Fusarium will grow on carpeting, wallpaper, and other fabrics and materials. This mold is often pink, white or reddish in color and is thus called red mold. Exposure to fusarium can cause a lot of problems such as allergic reaction symptoms and dermatitis. Sore throat, running nose, sneezing, and itchy eyes are just some allergic reactions to this mold. Prolonged exposure to fusarium may cause life-threatening conditions such as bone infection, brain abscess, nervous system damage, and internal hemorrhage. Fusarium can quickly spread so you have to be thorough in examining your home so you can mitigate the effects of this mold. Stachybotrys is black mold and is one of the most notorious types of black mold. What type of mold is black mold? Stachybotrys is part of the Aspergillus family and is considered to be very toxic. It can cause allergic reactions and cause life-threatening disease that affects the kidneys and liver. What does black mold look like? Stachybotrys appears as a dark or greenish black color and has a slimy texture. Examining the color is the best way on how to identify black mold. Black mold images will show that it can thrive on surfaces with cellulose material such as wood, cardboard, paper, hay, and wicker. Ulocladium is a type of mold that thrives in moisture. Homes and buildings with water damage will typically have Ulocladium growing on wet areas. This type of mold can be found in kitchens, bathrooms, basements, and windows with high condensation. Ulocladium can grow with other types of molds and cause asthma-like symptoms. Mucor is a type of mold that grows in thick patches and is often white or grayish in color. It often grows near air conditioners or HVAC systems. Mucor is an allergen and can cause asthma symptoms. The mold representative species identified so far are the most common molds that can be found growing inside homes and building but the exact number of mold species is still unknown. The mold names that have been discussed are the types of bad mold that can grow on your home after water damage or prolonged exposure to moisture. The colors of mold vary and can be helpful in identifying their type. White mold in houses may not appear as a specific type of mold so you should get a mold expert to identify the exact type and species. Molds cause a lot of health problems from the benign coughs and colds to the more extreme which include carcinogenic effects on kidneys and liver and internal bleeding. If you have an extensive mold problem it is best to do mold remediation or get mold experts or a professional mold remediation team. They can help you in identifying mold types and mold identification so you will know if you have something serious in your hands. Some mold species are more dangerous than others and if you’ve been exposed to the more toxic variety you will know that you may need to be examined or treated by a health professional. If you see brown mold with hairy like appearance growing on your home you may have less to worry about. Stemonitis or brown mold is less harmful. Experts have a clearer idea on what does mold look like in a house and they can identify immediately whether something is mold thus isolating the problem quickly. Having mold or fungus in house can be an irritating and distracting problem and you should remedy it at once. Once you have identified the mold you should get rid of moldy material immediately if you think it cannot be saved or salvaged. Professionals will often seal off the room or affected area because mold can easily become airborne. The next step is to dry the room with air movers and get rid of moisture and condensation by using air dryers and air scrubbers. If there are materials that can be saved from the mold it should be sprayed with a fungicide. The final repairs in mold treatment include replacing materials that have been water damaged and cleaning the area. ← What Are The Consequences Of Flooding?